The child's mother is visiting the U.S. from Honduras. By now you probably already know that the Zika virus can have truly awful consequences for pregnant women and their children because it can cause microcephaly (a neurological disorder that causes babies to be born with small heads and incomplete brain development). But because of Zika's mysterious nature, mosquito-borne transmission and tropical presence, you likely weren't aware of just how close to home this virus is hitting. Sadly, the second known case of a baby being born with Zika-related microcephaly in the United States has been reported. 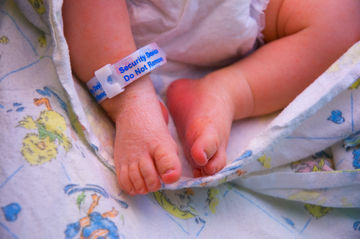 The mother in this particular case was visiting New Jersey from Honduras (where she likely contracted the virus) when she gave birth at Hackensack University Medical Center on Tuesday, May 31. Doctors examined the mother last Friday, at which point her ultrasound revealed her baby had "significant microcephaly." According to Abdulla Al-Khan, MD, the director of maternal and fetal medicine at Hackensack University Medical Center, the baby had calcification and dilated ventricles in the brain. "The mother is stable, obviously sad, which is the normal emotional reaction given the situation," Dr. Al-Khan said of her condition. At first, doctors weren't sure that this baby's abnormalities were caused by Zika, but tests were conducted to rule out other factors. Doctors believe the mother contracted the virus during her second trimester. "When she developed the symptoms, she was seen by an OBGYN who suspected the baby was growth-restricted," Dr. Al-Khan said. Though there are no known cases of anyone contracting the virus in the U.S., this latest case should serve as another reminder of how real Zika's consequences are. If you're pregnant or plan on becoming pregnant and you or your partner have traveled to an area where Zika is being transmitted, be sure to speak with your doctor and get screened for the virus—even if you haven't experienced any symptoms.